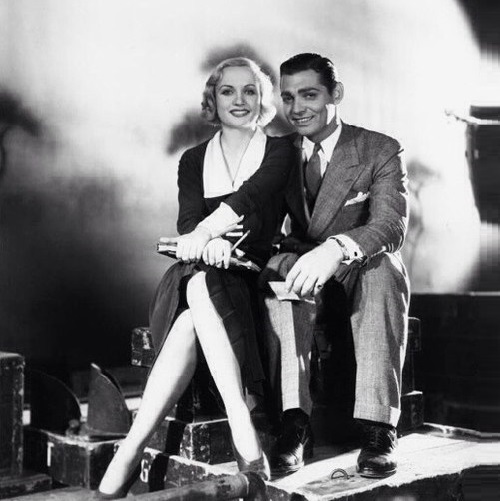 Beautiful Carole Lombard, who could equally well shine in front of the camera and swear like a trooper, and Clark Gable – “King of Hollywood” and ladies’ man. Their relationship became atypical Hollywood fairy tale with atypical tragic ending. In 1926, Carole Lombard had a car accident, in which broken windshield severely injured her face, from the nose to the left cheekbone. Carole had 14 stitches on her face, and a deep red scar. In the end, she made plastic, and the scar became less noticeable. She underwent the operation refusing anesthesia, because at that time, it was thought that the use of anesthesia does not guarantee the preservation of beauty. 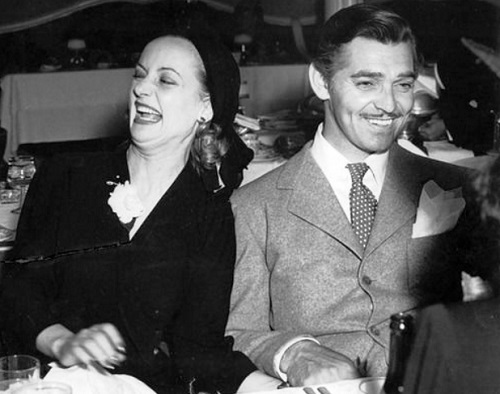 Clark Gable and Carole Lombard met on the film set, but “found” each other a few years later. In the mid-1920s, the actors starred in a pair of films, and played together only once, in 1932. 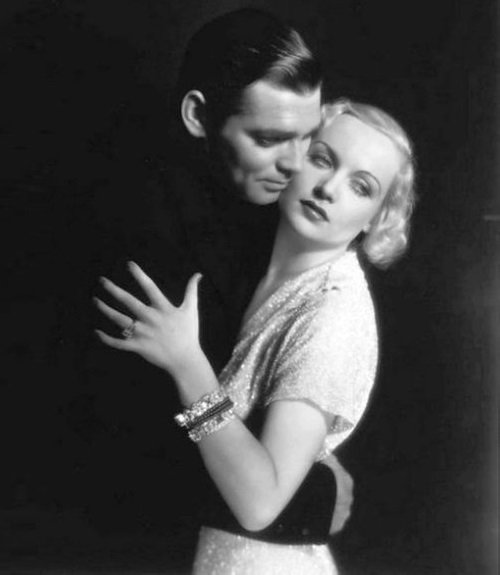 Gable easily fascinated his co-stars, at the time of the shooting was already known for his love affairs and was married a second time to Maria Langham (who, by the way was 17 years senior). 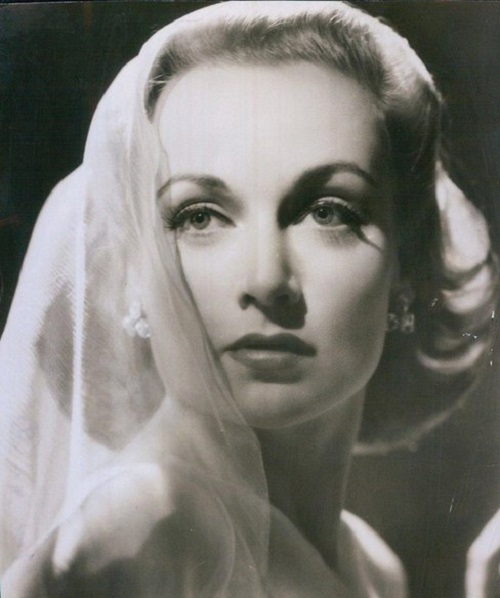 Carole Lombard was going to marry actor William Powell. 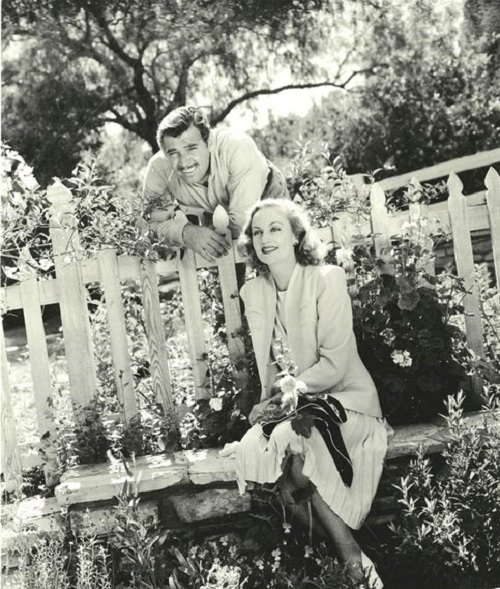 Promising comedy “No man of her own” brought Clark Gable and Carole Lombard some popularity, but didn’t become a breakthrough in the career of any of them. However, on the set, they made a beautiful duet, acting out the story of love of a card trickster and a librarian. 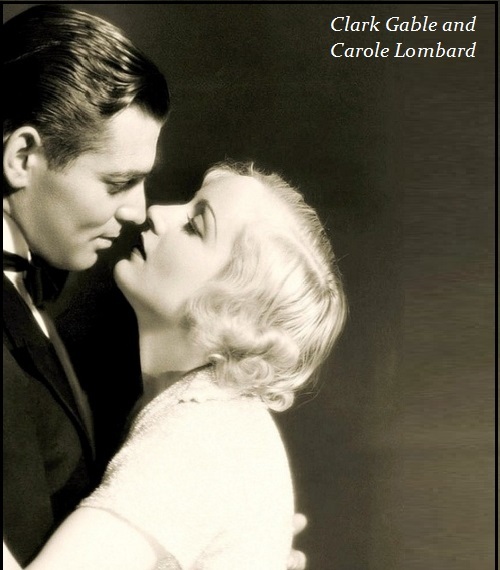 In subsequent years, the career of both took off, Gable starred in another comedy “It Happened One Night” and it brought him the only “Oscar”, and Carole was nominated for her role in the film “My Man Godfrey”. 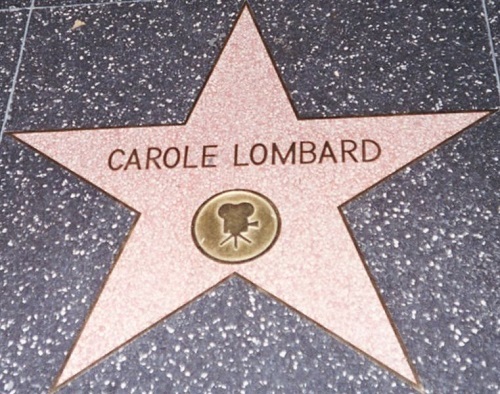 In 1937 the title of “King of Hollywood” has been officially and finally assigned to Gable, but, ironically, Lombard’s fees remained significantly higher. Once again they met in February 1936 at a party with the original name “Party-nervous breakdown” (after discharge from the sanatorium of writer Donald Stewart’s wife). Carole came alone, but with a fanfare in an ambulance (a joke in her style), and Clark was in a company of a beautiful girl. 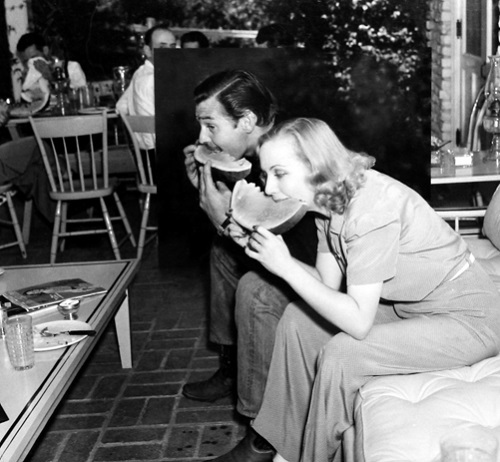 By the end of the party she went pretty offended because Gable and Lombard played tennis, and Carol won the game with a crushing score of 8-0. After a couple of months, they met at the ball. Gable tried to flirt with Lombard, but was rejected. The angry actor returned to his hotel room. In the morning, Gable woke up to birds singing, suddenly found himself in the room with birds. Of course, this surprise was planned and arranged by Lombard, on the agreement with hotel workers. He also found a note from her: “How about this? Carole”. Since then, their romance started. 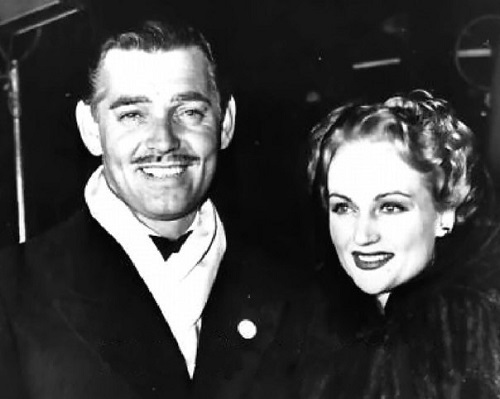 By the beginning of the filming of “Gone With the Wind” Lombard and Gable were informally married and were looking for a house not far from Hollywood. 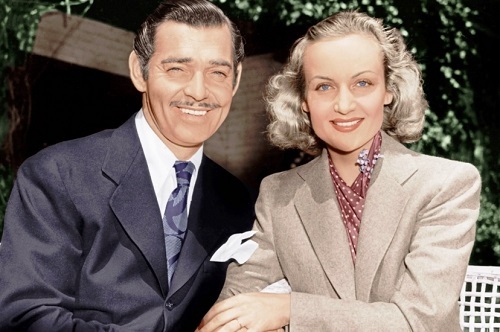 In March 1939, Gable divorced and a few weeks later, on the first weekend from filming “Gone with the Wind” Clark and Carole were married secretly in the town of Kingman, Arizona. 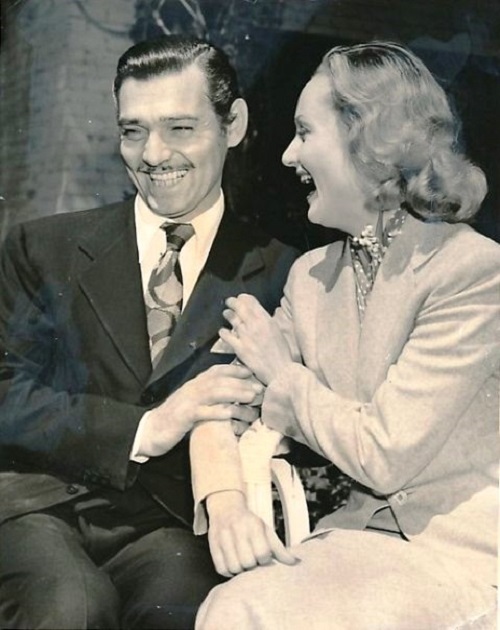 The next day they returned to Los Angeles, where the studio organized a press conference on the occasion of the wedding, but most of the questions Gable replied “no comment” and Lombard giggled nervously. 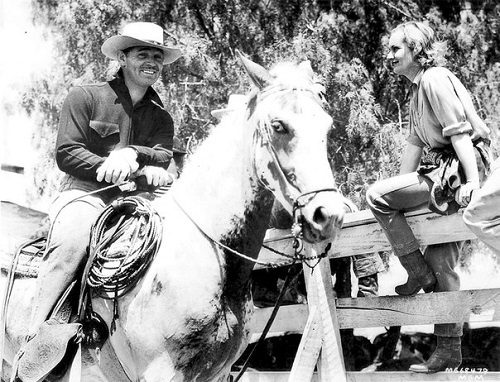 After the wedding, they moved to their own ranch in the San Fernando Valley. The house was bought on Carole’s money, as after the divorce from a previous wife Clark had to give her most of his fortune. 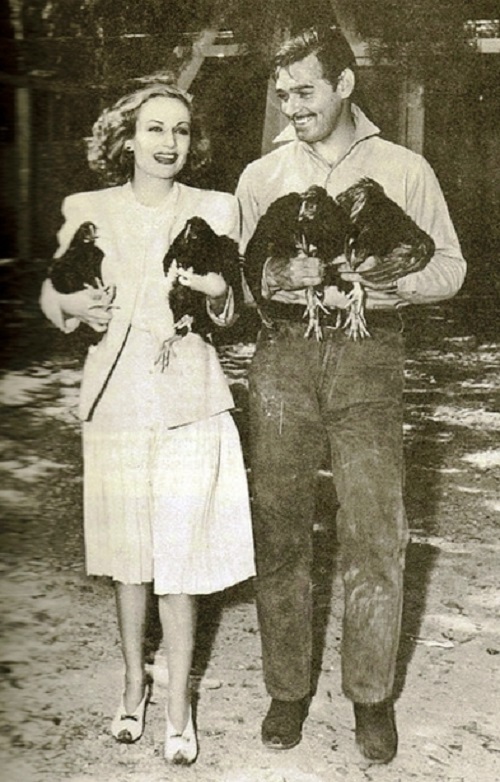 Together they went to hunt, which Gable was so fond of, were engaged in farming on the ranch, even tried to raise chickens, called each other “Pa” and “Ma”, planning to eventually get a bunch of kids. The couple wisely avoided emerging conflicts, not allowing them to destroy the understanding between them. Beings ironic, they often turned everything into a joke. Once, Gable, failing to tame the too bossy cow, the next day received a gift of a bullfighter costume from his wife. 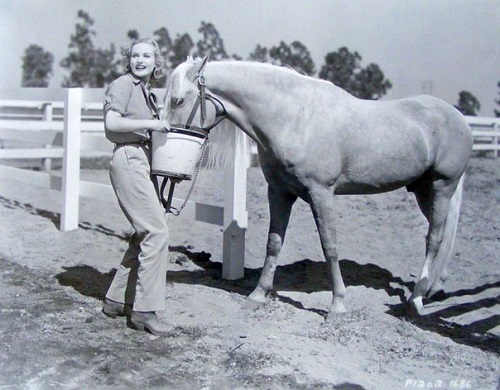 And when Carole boasted elegant riding suit, her husband secretly lent on a nearby farm decrepit mare and put it in a stall instead of restive stallion of Lombard. At the same time, Carole was quite jealous, remembering the former glory of the hero-lover, and was looking after her husband’s female partners that, if anything, to scare away an opponent. 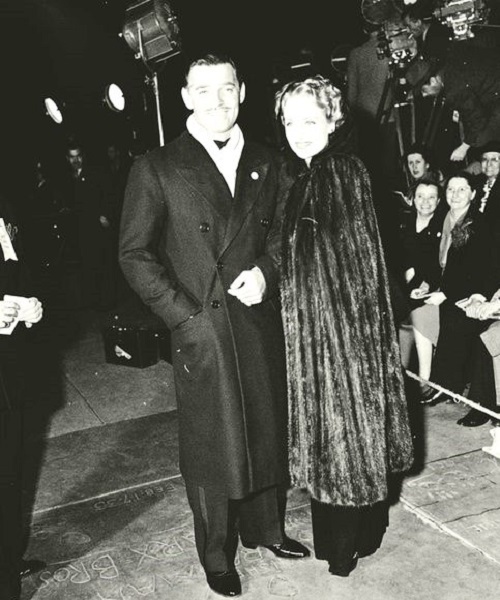 With the onset of World War II, Hollywood has become an important part of the propaganda machine, Lombard and Clark joined the fight as they could. 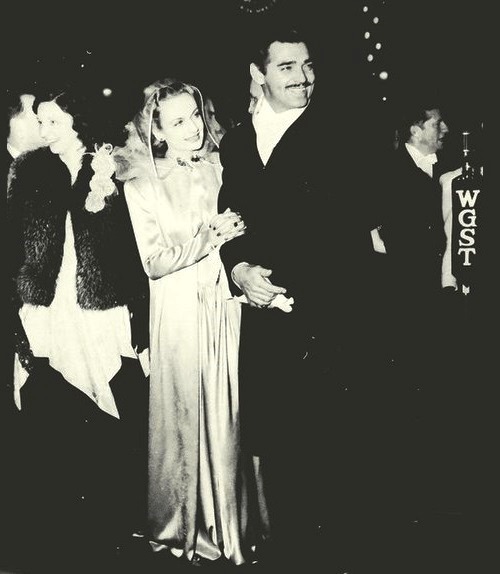 Gable starred in a movie, and Carole traveled around America, speaking at a rally in support of war bonds. 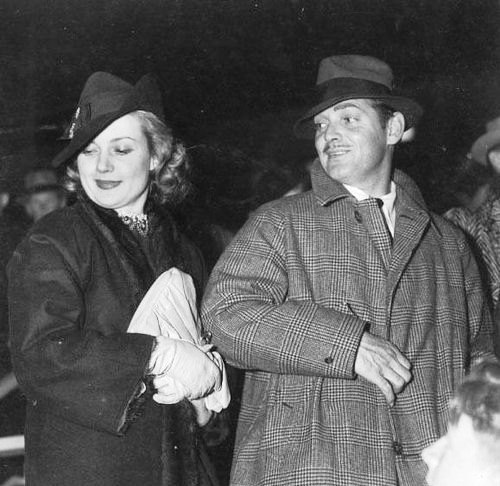 January 12, 1942 Carole went to the next meeting in Indianapolis. She had to come back in five days, for each day of absence, left a note for her husband. The rally ended, and at the last moment Lombard decided to fly by the aircraft to be home early. Clark was preparing a party for her arrival, decorated the house, and in the morning (the plane had to land about 9:00) went to meet his wife at the airport. The plane crashed into a mountain 35 miles from Los Angeles. All those who were on board were killed. Distraught Gable was not let at the scene, and one of his friends went up there with rescuers and brought him back ruby ​​earrings of Carole (Clark gave her for Christmas), and a lock of her hair. Gable was eager to find her engagement ring and even promised a reward, but the ring was never found. “Clark is not so easy-going and carefree, as he appears to the audience. He was not very happy in life, and he is prone to depression, so, I want to repay his misfortune as much as I can,”- said Carole. His wife’s death became a great tragedy for Gable. He drank, tried to somehow cope with the tragedy, and then decided to follow the example of his wife and join the fight against fascism. Although he was over forty, and MGM opposed every way this “madness”, in 1943 he finally became airborne bomber gunner. According to legend, Hitler, who was a big fan of acting talent of Gable, promised a reward to anyone who will take the actor alive. 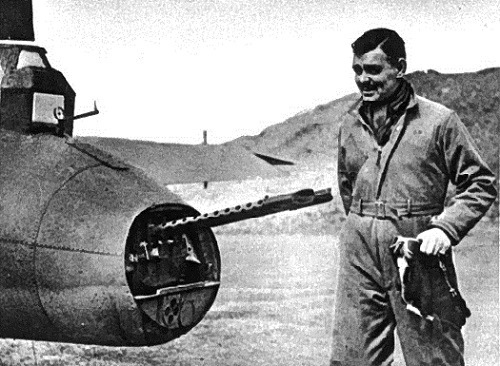 The plane of Gable was shot down, but the actor was not injured and returned home to Hollywood. Not finding calm in the war, the actor, saying he did not want to live now sought death, driving a motorcycle with crazy speed. After the death of Carole, he had love affairs, but all women looked like Carole, even beautiful Grace Kelly. He was married twice. Kay Williams, his fifth wife, was very similar to Lombard. She gave an aging actor long-awaited son. 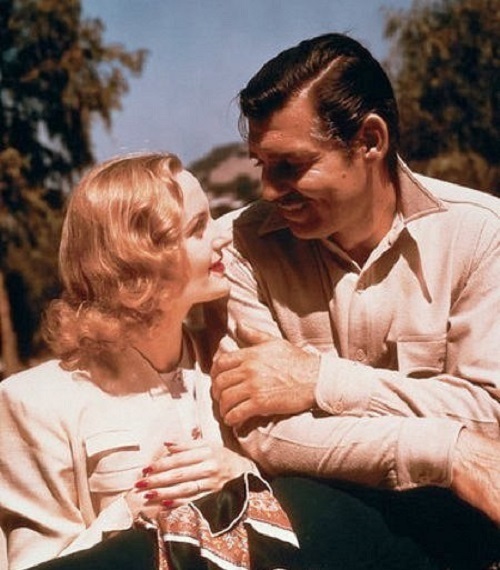 But Gable did not live up to his birth – in November 1960 after intense filming in the movie “The Misfits”, paired with Marilyn Monroe, had suffered a heart attack. 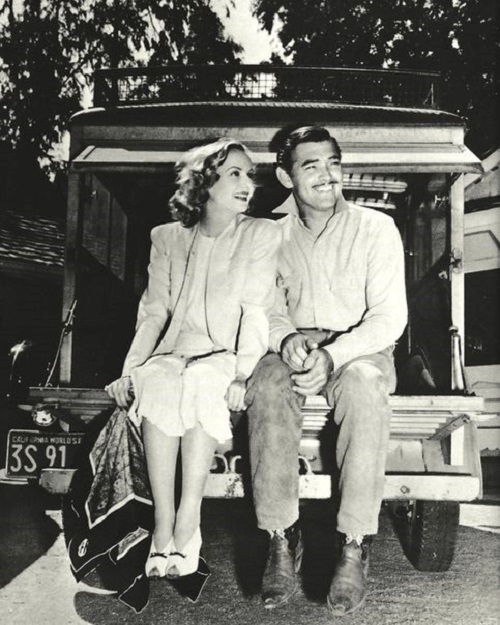 Gable died of on the set just a few days before the end of the film. Kay, fulfilling the last will of her husband, buried her husband in the family crypt next to his beloved Carole. “I was glad when he married Carole. It was a perfect match. They both hated hypocrisy, both so fond of this life. It’s terrible that Carol died in a plane crash. Clark came to me that night, when he heard about it. I just supported him at that moment. 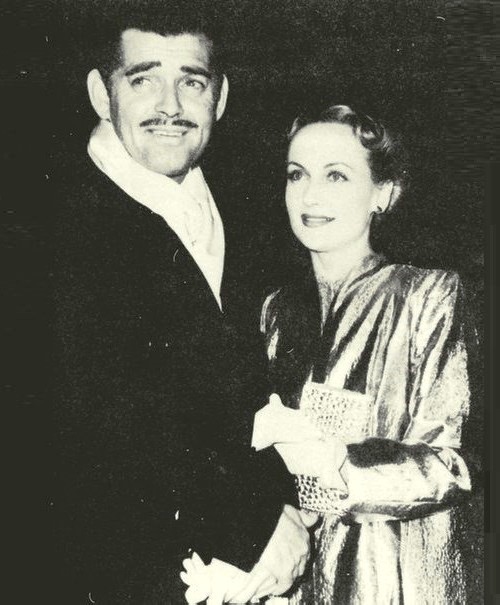 He was drunk and wept like a child, for him it was the end of life … and perhaps it was.” Joan Crawford about Clark Gable and the death of Carole Lombard. As if the same fate as his hero Rhett Butler, who for a long time could not come to terms with the death of a daughter, Bonnie, Gable decided to bury himself alive. Skinny and drunk, he spent whole days wandering the deserted ranch in search of solace. When the war began, the inconsolable widower, who considered his life down and out, in an effort to finally serve his country decided to go volunteer at the front. Forty year-old “King of Hollywood” after the death of his wife in panic afraid of flying, joined the squadron, and made many sorties, was promoted to officer. “I think she always knew she would not live to old age. In all the time I knew her, I never heard that she had made any plans for her own future. She did not expect to live a long life. I’m sure she knew it. Perhaps that’s why she tried to cram so much into her life. 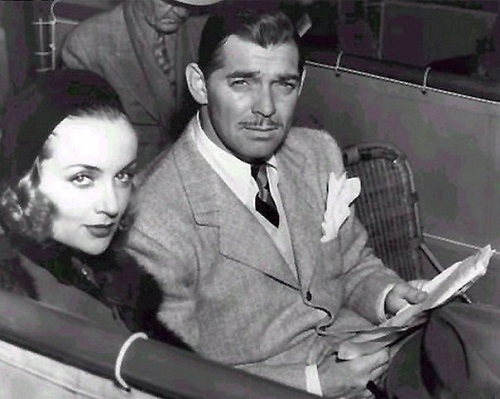 Maybe that’s why she never wanted to sleep, so she read as a glutton, every good book that she could get, so she seemed to enjoy life – and especially her life after she met Clark Gable – as few have ever done.”. – Adela Rogers St. Johns.